Mike Bowditch is a Maine game warden who hasn't spoken to his father Jack in two years, when late one night he receives a cryptic voicemail from him. 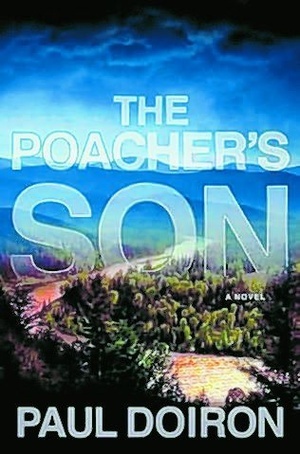 Soon he learns that his father is the prime suspect in the murder of a state trooper and a paper company executive. Although Mike acknowledges his father's faults, he remains firm in his belief that Jack is no murderer. Risking his career and relationships, Mike sets out to investigate the murders and track down his father. I won't say much about this in the way of a review, because I made the poor choice to listen to the audio version while driving and honestly my mind drifted away a bit too much. I think I would have liked it more had I read the book version. If you like audio though, I think it's a good bet - although I maintain that male narrators cannot do female voices, I mostly enjoyed the sound of this narrator's voice. Despite my inattention there are some aspects of this novel I definitely enjoyed. Born and raised in Maine, I always appreciate authors who can capture the authenticity of Maine and its people, which Doiron (the editor of Down East magazine) does most deftly. Also I admired Mike Bowditch and his struggle to balance his strong sense of what is right with his loyalty to his father. This is more of a crime novel than a traditional mystery, and though I don't read much in this genre I think the setting and characters are unusual and interesting. I will keep an eye out for more from this author, but I'll be sure to skip the audio version next time.